A live cam lets you watch tourists recreate the famous album cover—and it tells us something about images in the process. A man in blue jeans just walked across Abbey Road. He moved slowly, knees high and steps exaggerated, so that his companion could take a photograph of him midstep. I know this because I saw it happen. I watched someone cross the street in London from 3,600 miles away. Yes, there's an Abbey Road livestream, a video camera trained on the crosswalk made famous by the 1969 Beatles album Abbey Road. And as far as livestreams go, this one instantly joins the ranks of other beloved feeds like Explorer's bear cam and Nautilus Live's shipwreck cam— but it offers something all its own. The appeal of those other livestreams, in particular, is the rare access they provide. A close-up look at a brown bear swiping a slippery salmon makes you feel like you're in the freezing water with them. A diver's view of a shipwreck comes into eerie focus as she encounters it. But the Abbey Road Crossing Cam, run by the legendary recording studio nearby, is captivating in another way. It shows you something you've likely already seen many, many times—but rattles conventional framing. The livestream recontextualizes a geographic place that has been photographed from one vantage point over and over and over again, rarely considered from other angles. Experience Abbey Road on Instagram or Flickr, for instance, and you'll find endless imitations of the famous album cover. People like to mimic the album cover, the same way they jump up and down like Rocky on the steps of the Philadelphia Art Museum, or pose so that it looks like they're propping up the Leaning Tower of Pisa. The Abbey Road livestream reveals the sense of place behind the cliche. There are people lining up on either side of the street, waiting for a turn to cross. There are pedestrians who pause halfway for selfies, and foursomes who stop mid-stride. There's also a good deal of dashing out of the way—Abbey Road is busy with cars, vans, and double-decker buses just trying to get where they're going. With the volume up, you can hear the shushing of traffic and the occasional car horn. There's also an element of people performing for the cam. For the 10 minutes or so that I watched, I saw several passersby smile up at the camera. One woman paused to hold up what looked like the flag of Argentina. Another woman waved at the camera, smiled down at her phone and appeared to send some text messages before looking up and waving again. It sort of defeats the purpose, though, to post stills. Really, it's the right nowness and the motion of the livestream that makes it so watchable. Seeing people move through space and time at Abbey Road brings into relief that it's a real place, and underscores how it's always changing. All of which is much more interesting than the album-cover-esque framing we already know. It also raises the question of why so many people take the same pictures over and over. To pay homage, to be funny, to be part of something bigger, culturally, okay—but isn't it much more intriguing to see a landmark the way you've never seen it before? 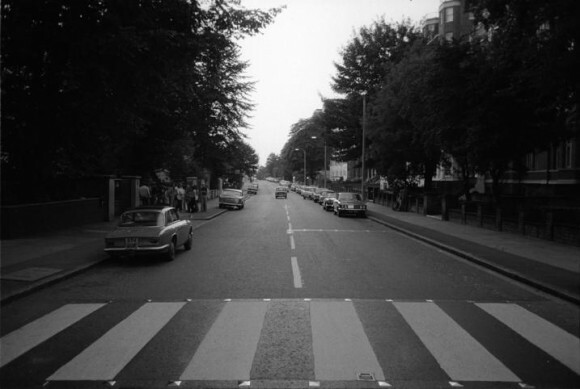 It's why there's something oddly compelling about a 1960s photo of Abbey Road empty, which evokes the sort of pleasant disconnect you get from looking at an image of a now-famous landmark from when it was still under construction. But our way of seeing the world is full of visual platitudes, more than we could ever possibly catalog, which we end up reenacting both intentionally and unintentionally. The writer Lawrence Weschler long kept a notebook of these sorts of visual rhymes. What he found was that people constantly echo what they've seen before—both geographically and interpersonally. For example, the generals who gathered around Che Guevara's deathbed in 1967, organized themselves such that they appeared, uncannily, like the figures in Rembrandt's famous painting, The Anatomy Lesson—an observation made by the novelist John Berger and passed on by Weschler in his book, Everything That Rises: A Book of Convergences. "Part of what I'm interested in is the way images set the context for other images," Weschler told C-SPAN2 in a 2006 interview. "We go through the world awash with these sort of cliches in our head... There are certain kinds of images that are just kind of hot-wired in us, and as we experience the chaos of the world, we perceive things in those terms." As Weschler began to look for them, he found these sorts of visual echoes everywhere. Like when The New Yorker featured Monica Lewinksy as the Mona Lisa on one if its covers in 1999, and, shortly after, Lewinsky then posed in a way that made her look just like the Mona Lisa. "If you look at those hands, and look at her posture," Weschler said, "she herself becomes the Mona Lisa." So much of people's understanding of the world comes from a visual processing of it. And we aren't always aware of the extent to which we adopt the frames and contexts we've already seen. The proliferation of digital cameras and networked photo sharing has only increased this sort of contextual mimicry—surely by now you've seen photographs in which everyone is jumping a few feet off the ground, or the tips of a person's Chuck Taylors peeking into the bottom of the frame of an image taken with a camera pointed at the sidewalk. How we choose to capture the places we encounter has as much to do with the people who have been there before as it does with our own experience of a place. And much of the time, people end up forcing an impression of an impression on a place—an idea they already had when they arrived—that may or may not reveal what the place is actually like at all.